Responding to the Critics – Exposing the Error of Howard Denham who grossly misrepresents Biblical Truth and Preterism! On this site, we frequently respond to the critics of Covenant Eschatology. I was recently contacted by someone that asked me to respond to some charges and claims made by Howard Denham, an acerbic, hateful church of Christ minister. Denham seems not to understand even the basics of Christian courtesy and decorum. He believes that anyone disagreeing with him has a one way ticket to hell already punched. He has continually – and purposefully – misrepresented my personal convictions, going so far as to tell an out right lie about what I believe about Genesis. When confronted with his fabrication he refused to admit it, and refused to repent. In October 13, 2017, on his personal FaceBook page, Denham made some claims about what I teach (what I supposedly teach) that once again powerfully demonstrates his utter lack of understanding of the Biblical eschatology. I must say that either Denham has virtually no reading comprehension skills, or, he is purposefully distorting what I said and what I teach. 1. Denham believes that God was through with Old Covenant Israel at the Cross. Beginning on Pentecost, God was dealing with the church, not Israel. So, Peter was looking forward to the coming of Christ, the restoration of all things, and those events were foretold “by the mouth of all His holy prophets since the world began.” Those were not NT prophets. Those were not prophets in the church. They were Old Covenant prophets– “Moses, Samuel, and all who have spoken.” Peter was looking for the fulfillment of Covenant promises made to the Old Covenant people Israel. ☛ Paul’s eschatological expectation was likewise based on and taken from God’s Old Covenant promises made to Old Covenant Israel. He said repeatedly that his hope of the resurrection was from “the law and the prophets”, from “Moses and all the prophets” (Acts 24:14f / 26:21f). He said that his doctrine of the resurrection was taken from and the resurrection would be in fulfillment of Isaiah 25, Hosea 13:14 and Daniel 12. What is so fatal to Denham’s view is that when Paul discussed his hope of the “redemption of creation”, i.e. the adoption, which he described as the resurrection in Romans 8, he then said that the covenant promise of the adoption belonged to Israel after the flesh (Romans 9:1-3). It was not a promise given to the church divorced and distinct from Israel after the flesh! ☛ John’s eschatology found in Revelation was patently the expectation, the urgent expectation of the imminent fulfillment of God’s OT promises made to Israel. There are over 400 allusions and echoes of OT prophecies of the last days, the time of the end, the kingdom, the resurrection, salvation, etc. found in the Apocalypse. And yet, according to Denham, the NT writers, all of whom were Jews, (with one possible exception) steeped in Torah and the promises there, were no longer concerned with the OT and the promises there. So, when Denham condemns me – and preterists – for saying that the promise of the Wedding was a promise made to Old Covenant Israel after the flesh, he is actually condemning me for simply believing and proclaiming what the Bible says.So, when it comes to responding to the critics, it becomes extremely easy to do! Consider the following very simple, but, devastating argument against Denham’s view that the Law of Moses ended at the Cross and that God was through with Israel at the Cross. God’s promises to Israel found in the Law of Moses remained valid after the Cross. This is proven by the facts presented above. The NT writers were all – post cross – expecting the fulfillment of God’s Old Covenant promises made to Old Covenant Israel! Therefore, it is not true that God was through with Israel at the Cross, and the Law of Moses ended at the Cross. Does Denham deny that God promised to remarry Israel in the last days? Does Denham deny that the promise of the marriage was a promise given to Old Covenant Israel? Did God fulfill His promise to remarry Old Covenant Israel after the flesh? If so, when, where and how? (Now, remember, the marriage / remarriage could only be accomplished through the New Covenant). 3. It is indisputably true that it was Old Covenant Israel, specifically the ten northern tribes, that had been married to YHVH, but, as a result of her “spiritual adultery” God divorced her and sent her into captivity putting her to “death” (Hosea 2:1-2 / 5:15-6:6). 4. The promise of the “remarriage” was the promise that the people that YHVH had divorced would one day be remarried. If Denham tries, as he does, to make the NT doctrine of the marriage of Christ to be with the church, having no relationship, no connection to the remarriage of the divorced nation, then God’s promises to Israel failed or were set aside. Does Denham believe that the church is the divorced 10 tribes? No! But, in rejecting that doctrine, he would in fact be rejecting the core message of 1 Peter, which is about the fulfillment of Hosea’s promise that in the last days, YHVH would remarry Israel! So, since YHVH said that it was the people that He had divorced that He would remarry, how does Denham transfer the promise of the Wedding to the church, having nothing to do with God’s promise to the ten northern tribes? To whom had God been married? Denham answered it, by admitting that “in the Old Testament the physical nation was the one divorced.” That is my point, Mr. Denham! If it was Israel after the flesh that was divorced, then it was Israel after the flesh (the righteous remnant which is always the focus) that had to be remarried! In our next installment, we will look closer at the nature of the restoration of Israel and deal more with the Wedding (Remarriage) and New Covenant motif. 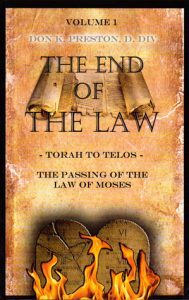 Be sure to get a copy of my book, The End of the Law: Torah To Telos, for an in-depth study of the passing of the Law of Moses. This book demonstrates, very powerfully, that the Law of Moses did not pass away at the Cross, and that the eschatological hope of the early church was the hope of Israel. As the reader can readily see, Mr. Denham makes it easy to respond to the critics! This book proves-very powerfully- that God was not through with the Law of Moses, or Israel, at the Cross!